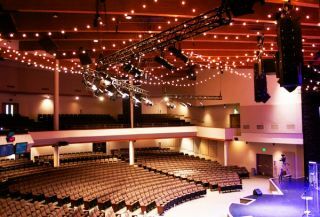 One of the Pacific Northwest's largest and most successful mega-church organizations, City Church has recently completed installation of KV2 Audio's new VHD loudspeaker system at their main campus auditorium. The rock & roll oriented church founded by Wendall and Gini Smith has grown to well over 6,000 members across four Seattle-area campuses. "The KV2 system delivered on all fronts," commented City Church FOH engineer, Joe Goods. "It's kind of a funny story - just after the VHD system went up, the improvement [in sound] was so dramatic that some friends asked if I had been fired and replaced by a better engineer. I wasn't quite sure how to take that." The new system is comprised of a single KV2 VHD2.0 high-mid cabinet, a VHD1.0 high-mid down-fill cabinet, four VHD2.16 subwoofers and an ESD12 side-fill cabinet per side. There is also a flown VHD2.21 double 21-inch subwoofer to extend the low frequencies. "The auditorium holds about 2,200 people and is extremely wide with a deep upper level balcony," said Goods, "yet, the coverage provided by the KV2 system, which is significantly smaller than our previous [leading] system, is smooth and uniform. We're not hearing any of the phase problems or high-end dead areas we used to have." The KV2 system was specified, sold and installed by Seattle's LIFT AV. Steve Palermo, LIFT AV president, added, "it's worth pointing out that the VHD system embodies the very best available technology from both the analog and digital domains. KV2 have optimized the amplifier and speaker relationship to provide superior output with relatively few components. We're not using room EQ or any other processing to get these results. Like all KV2 systems, this one was essentially, plug-and-play." The City has also begun using the new KV2 ESM26 compact, high-output stage monitors. Goods added: "Our musicians are commenting on how much better they can hear themselves play and sing. The clarity of the FOH sound that bounces back to them, combined with the louder [ESM26] monitors, is making a big difference." City Church holds weekly services at its four Seattle-area locations as well as numerous special events.